Faith Susan Alberta Watson (March 6, 1955 – March 21, 2015), better known as Alberta Watson, was a Canadian film and television actress. Watson was born in Toronto, Ontario in 1955. She grew up in Toronto with her mother Grace, a factory worker, and her brother. She began performing with a local Toronto theater group, T.H.O.G. (Theater House of God), of the Bathurst Street United Church at age 15. Watson took a workshop for the Hair musical. While doing this workshop she did Hamlet, which was directed by René Bonnière who later directed her in La Femme Nikita. Watson got her first role at age 19 in a CBC movie called Honor Thy Father. Early in her career she portrayed the role of Mitzi in George Kaczender's In Praise of Older Women (1978), for which she received a Genie nomination. A year later she received the Best Actress award at the Yorkton Film Festival for "Exposure". She moved to Los Angeles, California, and later to New York City. Watson lived in New Jersey for eight years with her husband until they divorced. She then returned to Toronto and focused on finding roles in independent films. She worked with director Colleen Murphy on the film Shoemaker (1996), for which she received a second Genie nomination for Best Actress. Among her well-known film roles are the bed-ridden mother Susan Aibelli in the 1994 American independent film Spanking the Monkey, Lauren Murphy (the mother of Jonny Lee Miller's character Dade, aka "Crash Override"/"Zero Cool") in the 1995 cult film Hackers, and Risa in the 1997 Academy Award nominated Canadian film The Sweet Hereafter, directed by Atom Egoyan. She played the role of Madeline in La Femme Nikita for four seasons from 1997 to 2001 (with guest appearances in the short fifth season). During the show's second season (in 1998), Watson was diagnosed with lymphoma, for which she had to undergo chemotherapy treatment which caused her to lose her hair. Producers at La Femme Nikita worked around her treatment and limited her appearances. Watson wore wigs in the show when she lost her hair. When her hair started to regrow, she sported the short haircut in her role as Madeline in the show's third season. Watson's first name inspired the character Alberta Green in the first season of 24. In 2005, Watson joined the cast of 24, playing CTU Director Erin Driscoll for 12 episodes of the show's fourth season. During 2007 and 2008, Watson played a supporting role in the Canadian television series The Border as the Minister of Public Safety. In 2010, Watson guest-starred in Heartland, a series on CBC Television, and she won a 2011 Gemini Award for her portrayal of Sarah Craven. 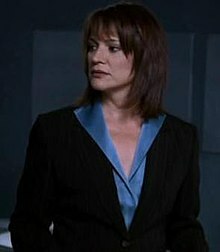 In a nod to her La Femme Nikita role, Alberta played recurring character Madeline Pierce in Nikita, the CW's 2010-2013 reboot of the film and TV series. Watson died on March 21, 2015, due to complications from cancer at Kensington Hospice in Toronto fifteen days after her 60th birthday. 1980 King of Kensington Mitzi Episode: "War and Peace"
1984 Hill Street Blues Prostitute Episode: "Fuched Again"
1984 Deadly Nightmares Jill Friedlander Episode: "Remembering Melody"
1985 The Equalizer Carla Holden Episode: "The Distant Fire"
1987 Street Legal Mercedes Puentes Episode: "Tango Bellarosa"
1989 The Equalizer Taffy Gould Episode: "The Caper"
1989 Street Legal Maria Lopez Episode: "Partners and Other Strangers"
1990 Island Son Nina Delaney Episode: "Separations"
1990 Grand Andrea Episode: "The Return of Yale Pinhaus"
1991 Law & Order Miss Hanley Episode: "His Hour Upon the Stage"
1992 Law & Order Angela Brandt Episode: "Skin Deep"
1993 Matrix Marie Sands Episode: "Conviction of His Courage"
1995 The Outer Limits Lynda Tillman Episode: "If These Walls Could Talk"
2000 Soul Food Judge Olivia Delaney Episode: "The More Things Stay the Same"
2003 Missing Mrs. Mastriani Episode: "Pilot"
2004 Puppets Who Kill Judge Episode: "Bill Sues"
2010 Heartland Sarah Craven Episode: "Where the Truth Lies"
Heyn, Christopher. "A Conversation with Alberta Watson". Inside Section One: Creating and Producing TV's La Femme Nikita. Introduction by Peta Wilson. Los Angeles: Persistence of Vision Press, 2006. pp. 88–93. ISBN 0-9787625-0-9. In-depth conversation with Alberta Watson about her role as Madeline on La Femme Nikita, as well as her more recent acting experiences. ^ Alberta Watson profile, filmreference.com; accessed March 23, 2015. ^ a b Rita Zekas. "Alberta's Feeling At Home On Deranged", Toronto Star, August 5, 1994. ^ a b Neil Morton. "In Praise of Alberta Watson", Elm Street Magazine; accessed March 23, 2015. ^ Bruce Blackadar. "Young Actress Is Behind Bars -- For A Movie", Toronto Star, August 7, 1980. ^ Profile of René Bonnière; accessed March 23, 2015. ^ a b c Jim Bawden. Toronto Star, Nikita's Iciest Femme Fatale, albertawatson.net, July 18, 1999. ^ Liz Braun. "Happy In Her Work", albertawatson.net, December 29, 1995. ^ George Kaczender profile, imdb.com; accessed March 23, 2015. ^ "Three Hours On A Plane Is All She Can Stand: Great Escapes - Alberta Watson", Interview with Fulton King, February 19, 2000. ^ "She Wasn't Afraid of 'Spanking'", San Francisco Examiner, August 23, 1994. ^ a b Profile TVGuide/Yahoo Chat, January 7, 1999. ^ a b c d Michelle Erica Green. "Alberta Watson: The Toughest Woman on Television", TheLittleReview.com; accessed March 23, 2015. ^ "'24' actress Alberta Watson dies at 60". Fox News. March 23, 2015. Retrieved March 23, 2015. ^ "awards database". academy.ca. Archived from the original on 2016-11-25. Retrieved 25 November 2016. This page is based on the Wikipedia article Alberta Watson; it is used under the Creative Commons Attribution-ShareAlike 3.0 Unported License (CC-BY-SA). You may redistribute it, verbatim or modified, providing that you comply with the terms of the CC-BY-SA.